If you are a computer user then of course you love to use your computer. You would like to customize your computer by this trick and the trick name is Change Computer Folder Icon & Color . Sometimes the folders are so many that they may literally cripple your productivity and you may be in a devil of a time trying to find the folder with the document you need at the moment. Plus, with so many similar-looking yellow folders it is easy to make a mistake and carelessly delete an important folder. To change a folder icon without any tools then follow the steps. Firstly select the folder you want to change the default icon. Secondly, select Properties from the drop-down menu. After that select Customize tab in the dialog. Then click on Change Icon… button. You need to select an icon from the default suggested list. After that change the icon by clicking on OK and then Apply button. Now you know the simple way to change your computer folder icon without any tools. It is too easy to do. Try it yourself now. Of course you can do it. It’s time to know how to change folder icon and color with tool. 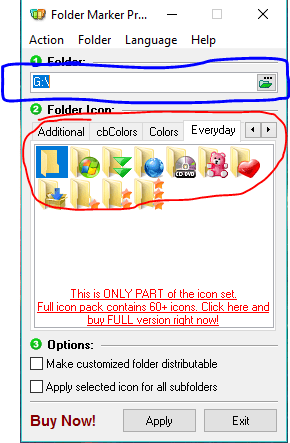 There is a tool which gives you the opportunity to change you computer folder icon and color. But there is problem that it has a Pro version and you know the meaning of pro version. It means you have to buy the tool. But don’t worry it will give you free trail for 30 days. It means you can do it very easily. So, let’s follow the instructions. You have to go to the bellow link to download the tool. So, simply click here to download the tool. After that you need to click alternative link text like the following way. Install the tool and simply Run it. Select you folder or drive to change it icon from the folder selection menu. And then Apply it by fill up the two option at the down. Through this process you can get your wanted thing easily. Now you know the way how to change computer folder icon. Hope you like and enjoyed it.